The lightweight skeletal graphite rotor design of the 4-ball bearing Speed Spin reel cuts out weight in all the right places, without hampering its structural integrity. The reels frame is dependable graphite construction that looks great in its silver finish. The anodized aluminum spool with blue accents adds to the classy look. 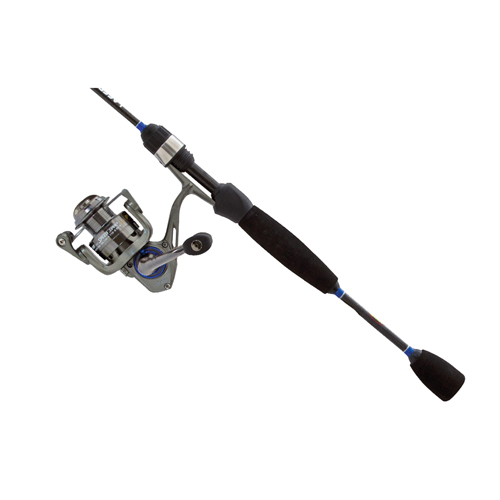 The Laser Lite combo rod is one-piece and comes in two ideal ultralight lengths, 5' and 5'6". The super sensitive IM6 light action graphite blank brings cast-ability and a fish-whipping performance to the outfit.